The Jaguars elected to bench Blake Bortles in the middle of today’s 20-7 loss to the Texans, instead opting to go with a quarterback that by definition would’ve been considered worse than Blake Bortles before the game. Surprisingly, he was slightly better. 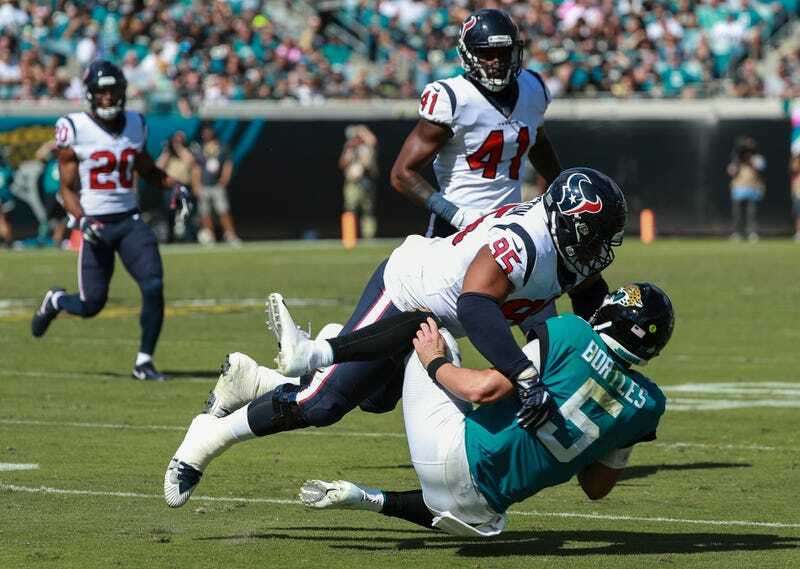 Through two and a half quarters today, Bortles managed 61 yards on 6-of-12 passing and two fumbles, both of which resulted in points for Houston. The offense went nowhere with him, because he gave it no chance. Backup QB Cody Kessler threw for 156 yards and a touchdown along with a pick. The benching of Bortles could be a sign that the Jaguars have reached their breaking point with the tongue-thrower. After his four-interception game against Kansas City, and the absolute stinker he put together against Dallas, Jacksonville didn’t want him to see through another performance like that. One reason head coach Doug Marrone would pick now to bench Bortles is because it’s suddenly dawning upon him that it’s sinking the rest of the team. Bortles’s disastrous career numbers speak volumes about his abilities, or lack thereof. When compared to 32 active quarterbacks who have thrown 1,000 passes since 2014, his average yards per attempt put him just a hair above Joe Flacco and Brock Osweiler. Also since that year, he’s turned the ball over more times than any quarterback with 26. The Jaguars wanted to build on last season’s AFC title game and keep consistency at quarterback, so they re-signed Bortles to a three-year, $54 million deal. After starting this season 3-1, they’re now 3-4, with a total of 28 points scored in those three consecutive losses. They still have a chance to trade for a QB who might be better than Bortles by the Oct. 30 trade deadline, but they reportedly don’t plan on doing that. They have the quarterback they wanted, and they are staying the course. The Jaguars are currently at critical levels of Bortles.